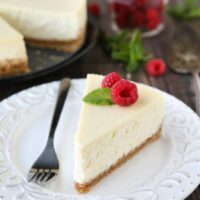 Classic Cheesecake Recipe - Dessert Now, Dinner Later! 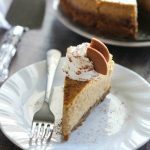 This Classic Cheesecake recipe is smooth, creamy, moist, and full of vanilla, with a graham cracker crust. Plus all the tips and tricks for the perfect cheesecake with no cracks! Great for holidays or any occasion. Cheesecake is a well-loved dessert, but can be intimidating to make at home due to its temperamental nature. Put all your worries to rest though. 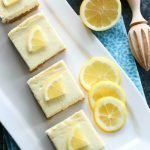 I’m sharing my best bakery tips to help you make a cheesecake successfully at home. 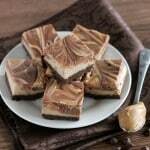 The ingredients of a classic cheesecake consist of cream cheese, sugar, eggs, and vanilla, with a graham cracker crust. 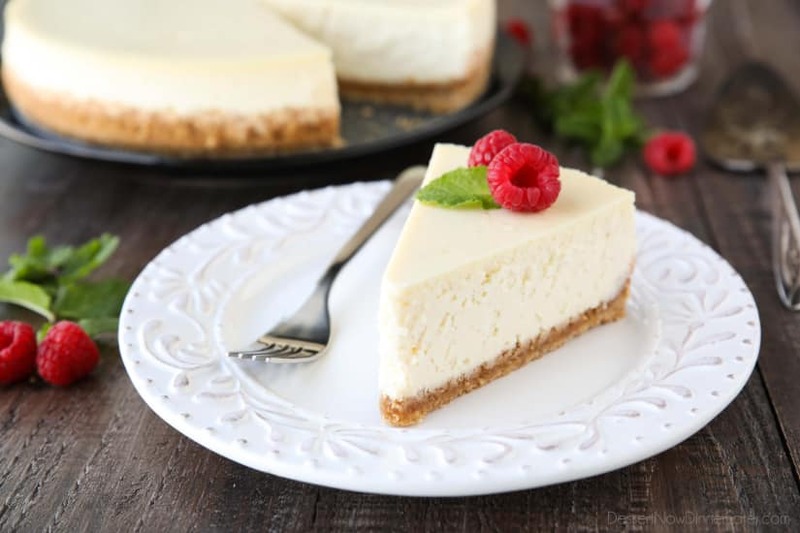 This cheesecake recipe has the addition of flour to help with structure (prevents cracking), and sour cream to soften the texture of the cream cheese and add moisture. Nobody likes a dry cheesecake! 1) USE ROOM TEMPERATURE INGREDIENTS – I know this can kind of be annoying, but planning ahead and putting your ingredients on the counter an hour or two before you start baking is very helpful. Cheesecakes don’t like extremes, so going from a cold refrigerator to a hot oven is sure to make it crack. EXTRA TIP: Bring eggs to room temperature quickly by placing them in a bowl with warm water for 10 minutes. 2) DO NOT OVER-MIX THE BATTER – A batter that has been over-mixed will have too much air. 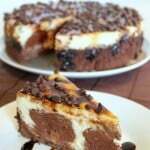 Too much air can cause the cheesecake to rise too quickly in the oven, then fall, and then crack. EXTRA TIP: After pouring the cheesecake filling into the springform pan, tap the pan (pick it up — just a little bit — and drop it) on the counter several times to make all the air bubbles rise to the top and pop before it starts baking. FYI: You can beat the cream cheese and sugar as long as you want, until it’s smooth. It’s once you add the eggs and other ingredients that you need to be mindful about not over-mixing. 3) USE A WATER BATH – In order for a cheesecake to cook slowly and evenly without browning the top, it’s best to use a water bath. A water bath, or bain-marie will also keep the edges from cooking faster than the center. EXTRA TIP: Double, triple, or quadruple wrap the outside of the springform pan with foil to keep the water out of the cheesecake. (Heavy duty foil is preferred. Use your best judgement on how much you need to keep the water out.) Then place a large roasting pan in the center of the oven with the cheesecake in the center. Next, use a pitcher to pour hot tap water around the cheesecake. 4) LEAVE THE DOOR SHUT – Once the cheesecake is in the oven, close the door and leave it shut! Opening the oven door results in a temperature change, which can cause the cheesecake to crack. 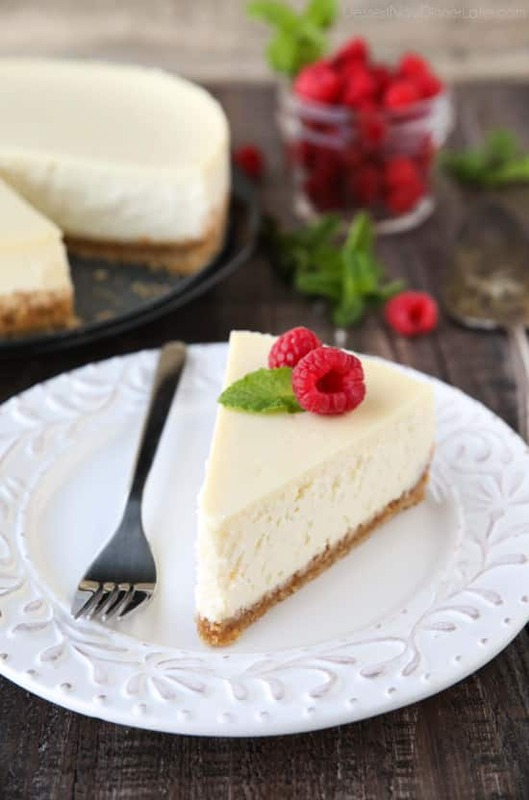 EXTRA TIP: The trick to telling if the cheesecake is done, is that it will no longer look shiny on the top, but will be dull/matte and puffed up in the center when fully baked. I highly recommend having an oven thermometer inside to ensure proper temperature during baking. 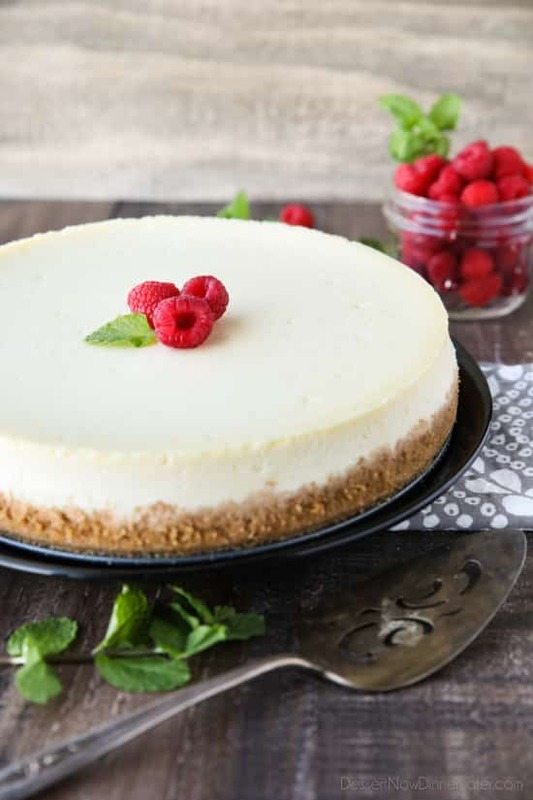 5) LET THE CHEESECAKE COOL INSIDE THE OVEN – Remember that cheesecakes don’t like extreme temperature changes. When your cheesecake looks finished from the outside of the oven door, just turn the oven off. Leave the cheesecake inside for 2-3 hours. (While working in a bakery, we would even leave our cheesecakes in the oven overnight until we came in the next morning.) By gradually cooling off in the oven, and with the help of carry-over cooking, the cheesecake will be fully-baked. This process will help prevent cracks from forming and keeps the top of the cheesecake from sinking in the center. Once you have completed all of the steps above, you will remove the cheesecake from the oven, discard the foil, and let it refrigerate for 4+hours. Chilling the cheesecake will also solidify any remaining jiggles. Cheesecake freezes really well. To do this, remove the refrigerated cheesecake from the springform pan and place it on a freezer safe plate or cardboard cake circle. Place a layer of wax or parchment paper over the top of the cheesecake. Tightly double wrap the cheesecake with plastic wrap, then cover it with a layer of foil. Freeze up to 3 months. If you’ve read through all of my tips, you’re now ready to make a cheesecake at home. You’ve got this! 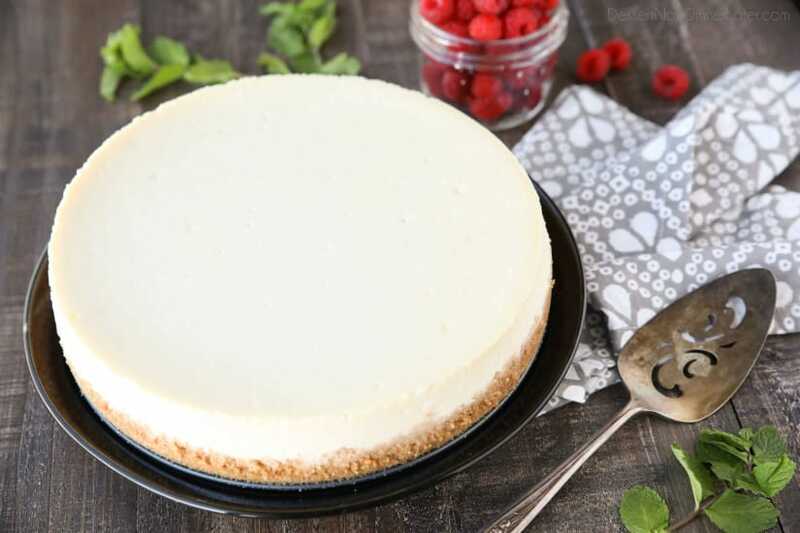 This Classic Cheesecake recipe is smooth, creamy, moist, and full of vanilla, with a graham cracker crust. MAKE CRUST: In a medium bowl, mix the graham cracker crumbs, sugar, and butter until moistened; press firmly into bottom of pan. BAKE 10-12 minutes until crust lightly browns. Set aside to cool. MAKE FILLING: With a stand mixer and the paddle attachment, beat the cream cheese and sugar on low speed until smooth, scraping the bowl well, occasionally. Add flour until just incorporated. Add the vanilla, lemon juice, and salt. Mix until just incorporated and scrape the bowl. Pour the filling into the springform pan over the cooked crust, and gently smooth the top. Tap the pan (pick it up — just a little bit — and drop it) on the counter several times to make all the air bubbles rise to the top and pop. REDUCE HEAT to 300 degrees Fahrenheit. Bake for 70-80 minutes; the top will be dull/matte and puffed up in the center. DO NOT OPEN THE OVEN! After the cheesecake is baked, turn the oven off; let the cheesecake stay in the closed oven for 2-3 hours more without opening the door. Remove the cheesecake from the oven; cool completely at room temperature. Remove cheesecake from water-bath and discard the foil. Cover the cheesecake pan with plastic wrap; REFRIGERATE until firm, at least 4 hours. Un-mold before serving. Use a HOT knife to slice pieces, rinsing and drying the knife between each pass. Enjoy plain or with your favorite fruit or toppings. 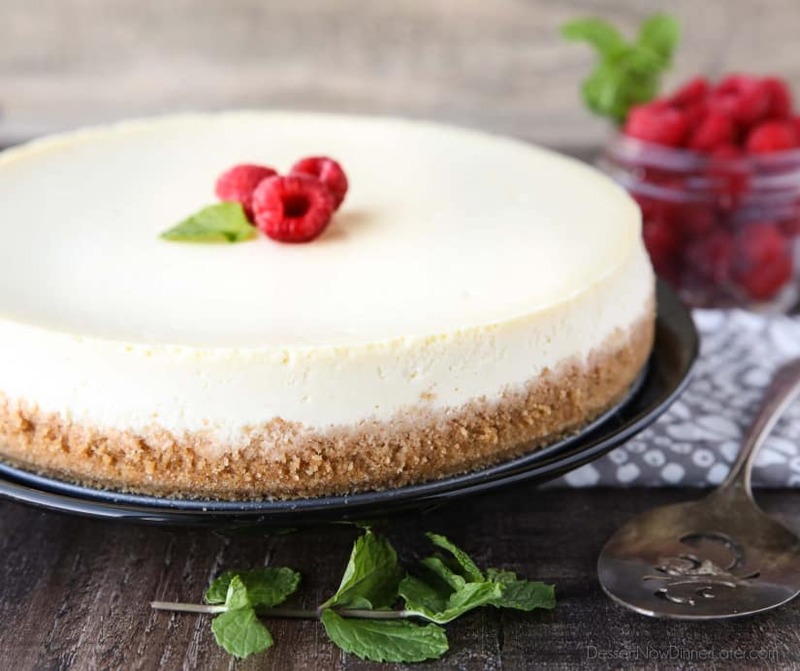 TO FREEZE: Remove the refrigerated cheesecake from the springform pan and place it on a freezer safe plate or cardboard cake circle. Place a layer of wax or parchment paper over the top of the cheesecake. Tightly double wrap with plastic wrap, then cover with a layer of foil. Freeze up to 3 months. Thank you!!! Can’t wait to try this.